Do you ever sit in front of your computer with a long list of to-dos and you can’t seem to move a finger nail to get any of them done? Yep, been there! It’s the task upon task upon task that’s brewing in your mind not letting you focus on what needs to get done. Or, hey, sometimes you’re just not feeling it, but you know you have to finish that project that’s been pending for a week. So, I came up with these 5 tips to calm your brain and get focused on the first task at hand. 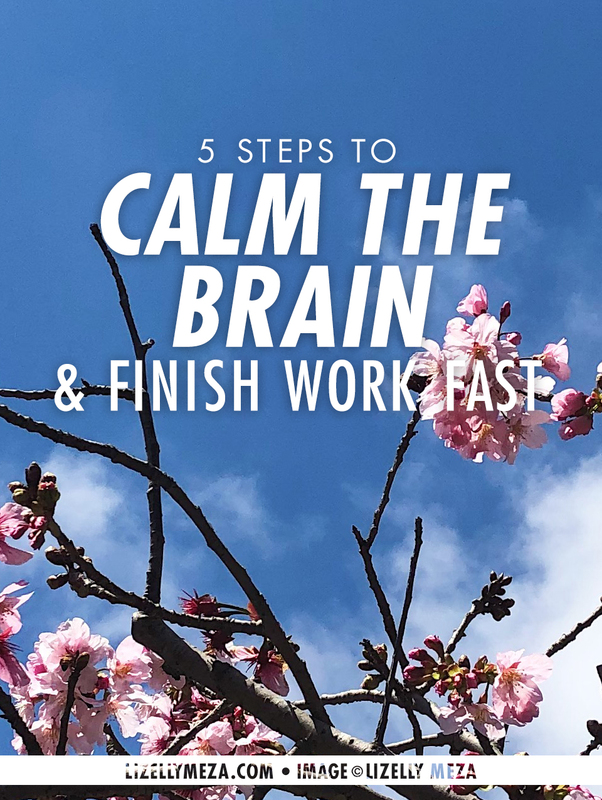 Believe me, once you tell your brain to chill the heck out, it will be easy to breeze through your projects and finish sooner than you thought. I came up with these 5 tips I use to set a focus intention to work through my daily to-dos one day when I had so many ideas in my head that I couldn’t seem to get anything started. I sat in mediation for a few minutes, set an intention to just calm down, and after 10 minutes of sitting in silence I was ready to start working. I thought, what if I set an intention every time before starting work on my daily projects? Yes! it turned out that what helped get the ball rolling was actually ‘talking’ to my brain and telling it what needed to get done. So here you go, the 5 tips to get into alignment & flow through your to-dos. This will take between 5 and 10 minutes. Think about what you’re going to work on and visualize how you want things to flow. What does it look like to get this task done and feel accomplished in the end? With all the ideas in your head, sometimes it’s difficult to see the next step to take. This is where literally asking for the steps to take comes in handy. Remember, it’s all about getting clarity and getting focused, so verbalizing the desire helps to get it out from your jumbled brain. This is a big one. Sometimes even after setting an intention and asking for guidance, you brain may get frazzled with the ideas popping up, so in asking for everything to work out in the paced momentum you can take action in, you’ll to be able to work on said project in inspired alignment. The act of giving thanks and being grateful for what’s still to be worked on is a form of letting go of the process as if it already is accomplished. This is telling your brain there’s no reason to worry about how to move forward, it’s already done, and you just need to take the steps presented to you. Start your task with as little distractions as possible so that the intention-setting work done previously will serve its purpose and not be forgotten. Sometimes the first steps to take are to make lists, to get all the ideas out of your brain, to get a clear picture of what needs to get done, then you proceed with the 5 steps above. Other times, it’s just to get DOING, when an idea sparks and you go with the momentum of it rather than stopping to write it down, make a list, and schedule a time to work on it later. I know how hard it is sometimes to move forward on our tasks. While I allow myself to take naps when I've already taken some action and I need some mental clarity, I sometimes also push myself to just get started. I know once I do, the momentum will flow, and I'll breeze through many projects pending. Tell me, have you tried any of these brain-calming methods before? Please share in the comments below.